Candela's Exhibition Tour: A Sucess! 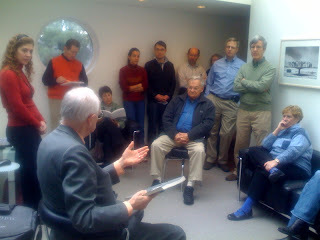 The two dozen of us who came on February 7th to the Princeton University Art Museum for Felix's Candela Exhibition Tour were in for a treat. Professor David Billington '50 gave us a brief background of how this exhibition (and the Swiss Legacy exhibition that preceded it) grew out of his lifelong teaching and research of elegant civil engineering structures. Then Professor Maria Garlock, who was fundamental in the creation of the Candela exhibition, introduced the "artist/builder/engineer" and talked about the challenges and effort incurred by herself and a team of students to make the exhibition possible--from translating blueprints to creating the spectacularly fragile models on display. The group walked around the displays, learning about the ways Candela used the hyperbolic paraboloid in his astoundingly thin-shell concrete structures and his signature "umbrellas." The running conversation with experts on the subject made for a casual, enlightening and educational experience. Professor Billington and Professor Garlock: thank you for sharing your time, knowledge and passion for beautiful engineering with us! The dynamic and downright attractive brain trust of PA3 gathered in Frist to set a course for this resurging organization. Pictured here are Gia, Yakov, Bettina, Kristin, Sev, Grace, and Arlen. After developing a cost efficient method of manufacturing thin film photovoltaic roofing material, they worked to solve more vexing problems like increasing PA3 membership, selecting a logo, and scheduling next month's meeting. A good time was had by all! Area alumni are invited to the IMAGINE Speaker Series featuring Roderick McNealy’72, Director, Johnson & Johnson Marketing and Advertising College and Faculty Member, The Wharton School, University of Pennsylvania. Come and hear the career story of Rod McNealy. He will talk about his career journey and his experiences in leading the advertising and market communications that have made J&J a world-recognized leader in market communications. His background includes marketing, advertising, market research, and strategic planning. He is the author of two books on Quality Improvement and Customer Satisfaction. He received his MBA from Harvard University. The Princeton University women’s basketball team will be taking part in the WBCA Pink Zone on Friday, Feb. 13 when it hosts Yale at 7 p.m. In addition to the Tigers wearing pink uniforms for the game, the coaching staff and cheer squad will all be wearing pink. Pink Zone t-shirts will be available for purchase for $15 with all proceeds going to local and national breast cancer organizations. All fans wearing pink to the game will gain free admission. Other activities and promotions planned for the event include: free coffee, pink cupcakes and cookies provided by Princeton Dining Services. Commemorative pink towels will also be handed out, courtesy of the Princeton University Women’s Center. At halftime, members of the audience who have been affected by breast cancer will be asked to come down to the court and form a human ribbon at center court. Jadwin Gym will open for fans at 6 p.m. and the Tigers hope to have a record crowd on hand to participate in such an important event. For more information please see the flyer.